Your guide to stepping up to the craps table, in real life or virtually. This page is a craps guide to make sure you don't make any etiquette blunders your first time out at the tables. Why would this page be needed here more than at say, a blackjack guide? The answer is truthfully because craps players are a different breed. You can be sure there are a high percentage of superstitiously influenced people around the craps table at any one point in time, and we have to make room for these beliefs. Also, craps players aren't known to be the most patient gamblers in the world. With these things known you can understand why it's a good idea to have a good idea of what you're doing at the table. Previous pages on this site should provide you with the basics of making the most common craps bets, and this should be considered the jumping off point for anyone who wants to fit in at the craps table. The first and most important thing is to understand the basic bets. Read up in our craps rules and then craps strategy sections to become familiar with both basic and not so basic bets on the table. There we walk you through each bet you may come across in your travels, and explain them in a simple straightforward manner. If you've got any questions keep in mind you can get in touch at any time and we can probably get your question answered quickly. A crowded craps table is not the place to look for advice or answers, unless you happen next to a generous talkative patient type. The dealers are usually too busy to teach anyone, and often resent novices just diving in, as the casino probably offers free training courses during the day when the tables would otherwise be closed. So take advantage of that free training, or practice online here and read up, either way you'll be covered. There are a couple of phrases that are commonly hollered by the dealers, especially to novice craps players, and we should go over these here so you know what you're listening to. One common phrase is "Hit the back wall please!" which is pretty self explanatory: the dealer is talking to the shooter and they want them to throw the dice hard enough to bounce off of the 'back wall' of the table. The back wall is usually cut in strange shapes to ensure a random roll (yes apparently its possible to become so good at rolling a pair of dice that you can hit what you're after more often than chance would allow). 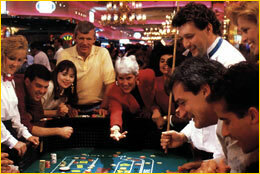 Another common phrase heard at the craps table is "don't aim for the chips" - again, not a tough one to figure out. The craps table is a dynamic environment, and often the shooters accidentally hit the chips laid out as bets on the board as they throw. This just means the dealer has to restack the chips in the proper amounts, an annoyance for them. One tip I can give you that is essential at the craps table is this little piece of advice: always tip the dealer. Say you win 300 bucks on one roll, what do you do? Drop at least 10 or 20 back to the dealer. Its standard casino etiquette to tip your dealer if you happen to be doing well, and craps is no exception. To tip the dealer just say 'ten for the house' and hand them some chips (as with learning anything else in the casino, easiest way to catch onto how something is done normally, is to let somebody else do it first and then imitate them). Just like at the blackjack table, you can also play a bet for the dealer. If you want to place a bet for the dealer (its like tipping them but they have the chance to win on the tip) stick to the pass line or come bets, as those provide the lowest house edge, and the dealers know this. One essential bit of info for a good craps guide must be addressed. Being courteous to the players around you is more important for craps than any other game in the casino. 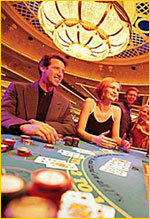 Its easy to grab a good spot at the craps table and quickly loose site of the people milling beside and behind you. Be aware of the people around you, make room at the table for someone who wants to join, make room for the people already playing around you, don't crowd too much, nobody likes that. Be kind and give tips to people who are obvious novices, they will appreciate it and everybody else will too, because it means they don't have to. If you see someone making stupid bets, don't call them stupid. Don't make a big deal of it, but if you do get the chance have a chat with them about the house edge. If they seem they need to learn a bit more, teach them, if they know everything already they may think they are an expert. More important than these things though is your actions in relation to the game-play. Being courteous isn't just being nice, its supporting the other players. You know by now in craps you can bet with the dice or against the dice. Either option is fine, and you will see a lot of people yelling for the numbers they want to hit, but you wont often find people yelling for numbers that will make them win, but make the shooter lose. For instance, if you're playing against the dice and the point has already been set, you can win if a seven comes up, but the shooter and everyone playing with the dice will lose if a seven comes up, so don't start yelling for sevens, your presence wont be appreciated for long, and you can avoid the defined need for pain killers. And if you've never been to a casino at all, a phrase you can hear if you're sitting at any table game at all 'Cocktails' or 'Cocktails anyone?' - the drinks are free in American casinos (Canadian casinos have to follow a federal law banning the impartment of free alcoholic drinks, just free Pepsi there I'm afraid), European ones I'm not so sure. But if you feel like a drink just place an order, in a few minutes the waitress will return and give you your drink without asking for any money. Always tip the waitress.